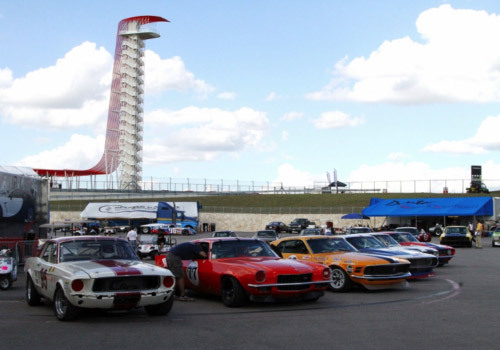 The 2014 SVRA season closed out at one of the most impressive racetracks in the world – Circuit of the Americas. It is the only place we race that is within 700 miles of our shop! 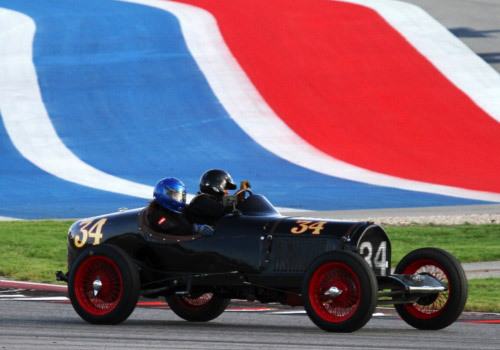 It is a perfect place to afford the best drivers in vintage racing the chance to compete for a National Championship. 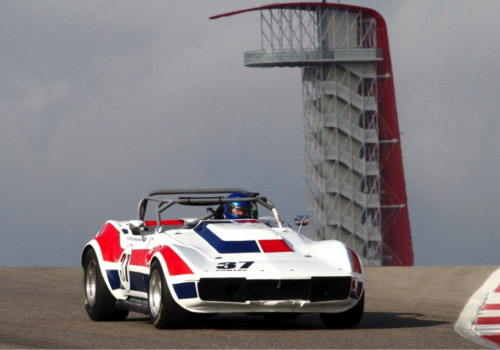 This year’s race drew almost 500 competitors, down a few from last year as the race was held on the same weekend as the SCCA Runoffs. In spite the track’s convenient location, we only brought 3 cars. Edward had sold the company’s #38 car, and several customer cars were grounded due to business commitments, engine overhauls or other issues. 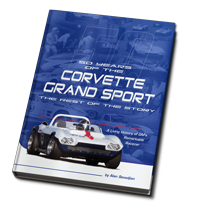 We again took care of Tony’s 1934 Indy car, Clair Schwendeman’s #37 68 Corvette and the 69 Corvette of Jim Kitzmiller. We also shared out awning with our buddy Mark Hilderbrand who took care of his own car, old school style. Clair’s car had been involved in a scrape against the blue Armco at Watkins Glen in September, so it was freshly painted. Jim hadn’t run his car since COTA 2013, other than in testing at Eagles Canyon. The weather threatened rain all weekend, but the track was generally dry or at the worst just damp most of the time. going to be on the podium. Clair had planned to run both the sprint race and the enduro, but unfortunately he couldn’t buy a break this weekend. 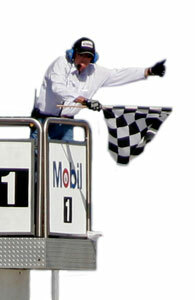 In early practice he appeared quick enough to challenge for a podium finish. His plan for the enduro was to share the driving duties with Alan, who would therefore need to get in a couple of practice sessions. Both those sessions ended badly! Edward practicing in Jim’s car with Alan following in Clair’s, just realizing he has no brakes! While following Edward, the right front caliper on Clair’s car sprang a leak at the end of the long back straight. Alan had to spin the car to keep it off the wall. No problem; the Duntov crew changed the caliper and sent Alan back out to bed new brakes on a wet track Saturday morning. That turned out to be the car’s last session of the weekend, as Alan brought the car back with a dropped valve! This was not Clair’s weekend, and for sure not Alan’s. For Duntov, the National Championship weekend was now down to the Sunday enduro, with only Jim Kitzmiller’s car still running. Jim teamed up with Edward and neither driver made a mistake. 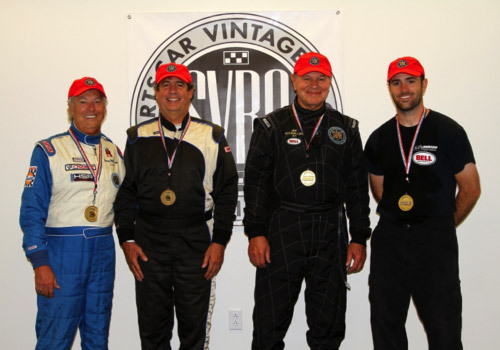 Unfortunately, in SVRA enduros, Group 6 cars run with the fastest Prototypes and Can Am cars at the race meet. 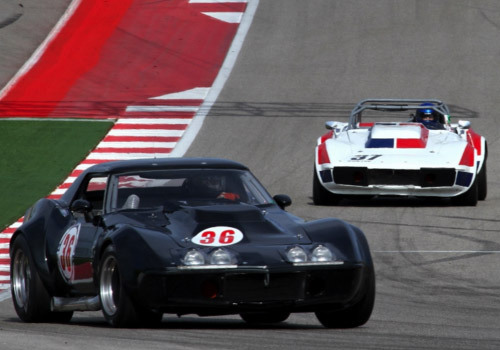 A Group 6 Corvette has zero chance of competing with 5 year old LeMans winning Audi’s, but cars like that make up much of the rest of the field. Although the Group 6 cars try to beat anyone in front of them, they actually only compete for the Championship against the other Group 6 cars in the field. The race was 90 minutes long with two mandatory 5 minute pit stops. The plan was for Jim to start and to bring the car in at the first full course yellow. Jim came in on lap 8 for a driver change and a splash of gas, still on the lead lap. After the pit stop, Edward rejoined the field in 19th place overall and third in class. What happened next was really cool! Edward started turning laps 4 seconds a lap faster than the class leaders. He was closing on them big time just as rain began to fall. 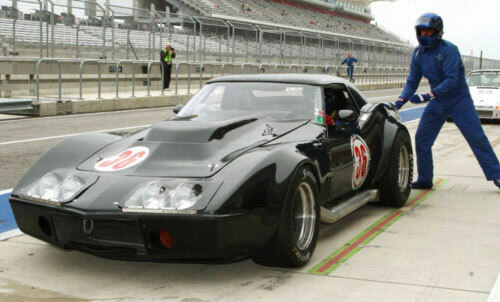 It was only his second session on the track in that car, and on a damp track he turned his fastest lap, a 2:26.2. The next fastest Group 6 car’s fastest lap was a 2:30. The race ended under a full course yellow with everyone following the pace car in a steady rain; Edward was 7th overall and first in class!